Notes: This item does not come with Windlace. If windlace is needed to complete your install, you can find that item here. Installing our headliner replacement kit is a job that can be accomplished by most do-it-yourselfers, but different people may have different results. 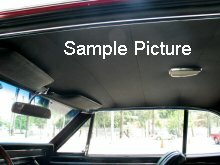 If you do not feel comfortable installing your headliner kit, you should find a local professional to help you with the installation.